Review the relevant immune-mediated events contributing to liver pathology and the progression of liver disease. This program is designed to address the professional practice gaps in all six competencies including patient care, medical knowledge, practice-based learning and improvement, interpersonal and communication skills, professionalism and systems-based practice. This program will provide updated information based on the new guidelines and recommendations based on the most current research presented at the national American Association of the Study of Liver Diseases Meeting, November 9-13, 2018, in San Fransisco, CA and will go a long way towards improving patient outcomes. REGISTRATION FOR THIS EVENT WILL CLOSE AT 10:00am ON April 4, 2019. Please register prior to that date so we can format your name badge and have you listed on the sign in sheets.Walk in registration will be available. Registration fees, if applicable, must be paid by check at the registration desk. An additional fee of $10.00 will be added for processing at the registration table. Saint Louis University School of Medicine designates this live activity for a maximum of 4.0 AMA PRA Category 1 Credits™. Physicians should only claim credit commensurate with the extent of their participation in the activity. Other learners will be provided with an attendance certificate designated for 4.0 AMA PRA Category 1 Credits™. It is your responsibility to know if your CE board will accept AMA as reciprocal credits. 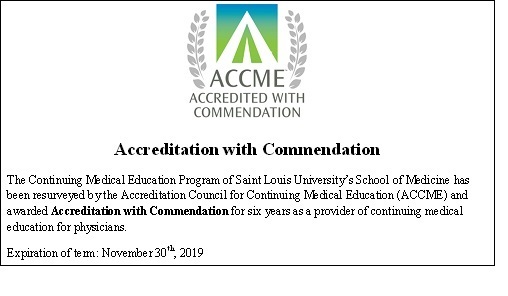 AAPA accepts certificates of participation for educational activities certified for 4.0 AMA PRA Category 1 Credits™ from organizations accredited by the ACCME. PAs may receive a maximum of 4.00 AMA PRA Category 1 Credits™ for completing this activity. FREE Self Parking in the parking lot surrounding the building.